I like to think that when we do good things, sometimes the universe smiles down upon us and miracles happen! If you want to read just such a story, be sure to visit the Good Samaritan Pet Center website and check out their newsletter page http://www.goodsamaritanpetcenter.org/newsletter.htm. Click on the Summer 2008 newsletter and read the article called Brotherly Love that begins on page one. 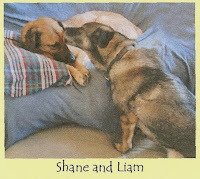 This is the story of Shane & Liam, two 8-yr old Shepherd mix brothers who had been at Best Friends Animal Sanctuary in Utah for 5 years. What happens after Beth Springer, Executive Director of Good Samaritan, visits the brothers is sure to bring smiles and joyful tears.